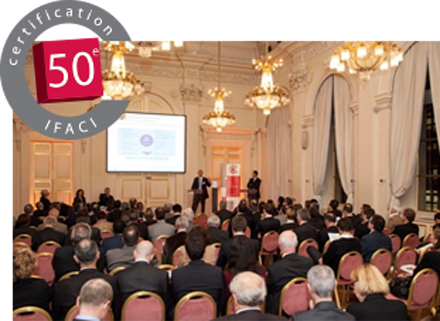 IFACI Certification had the pleasure of awarding its 50th Certification to the Chief Audit Executive of Groupe Eurotunnel on Thursday, 22 November 2012, ceremony which took place at Palais Brongniart. “I would like to commend the IFACI certification, which is proving to be highly useful. It demonstrates the importance for companies of third party assessment. It provides reasonable assurance that the Internal Audit Activity is indeed focused on the areas of strategic importance to the Organization. Anything that helps successfully complete and improve the performance of the Internal Audit Activity can only be welcomed from a regulatory and control perspective”.